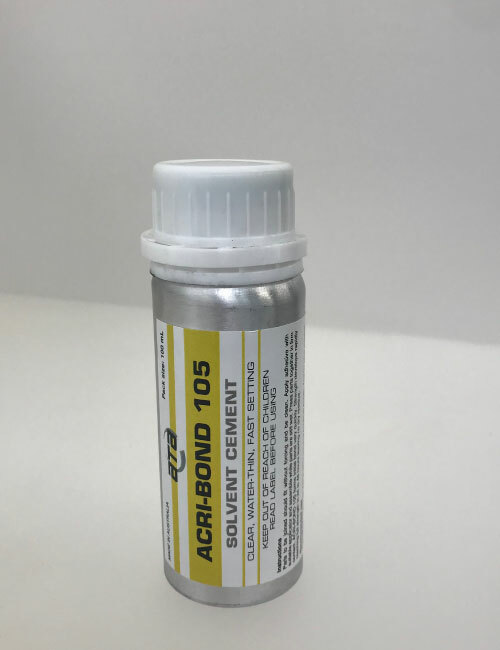 Acribond 105 acrylic solvent adhesive is very fast curing water thin solvent adhesive or cement. This clear adhesive is ideal for bonding acrylic to acrylic. Whilst also suitable for a range of other materials. Acribond 105 acrylic solvent adhesive is very fast curing water thin solvent adhesive or cement. This clear adhesive is ideal for bonding acrylic to acrylic. Whilst also suitable for a range of other materials. Generally it is used for edge gluing since it softens the surfaces and welds them together. It produces strong, optically clear joins. Application with a solvent applicator is recommended. This acrylic solvent adhesive is best for bonding Acrylic to Acrylic. However it also can be used bonding Polycarbonate, HIPS, ABS and PETG to itself. It’s best to test before use for mixed or other plastic material combinations.